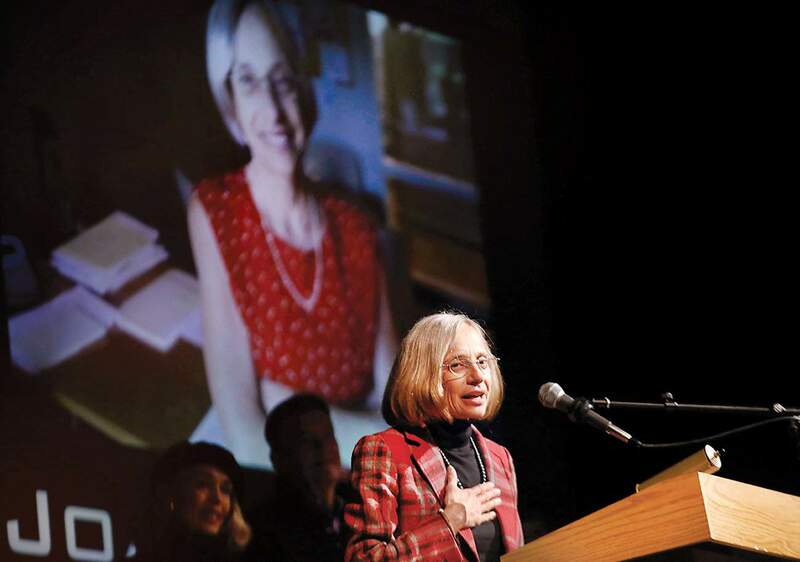 Joanne Spina, former La Plata County manager, gives a heartfelt thank you Thursday night after being named Citizen of the Year at Durango Rocks, the Durango Chamber of Commerce’s annual award ceremony held at the Community Concert Hall at Fort Lewis College. Joanne Spina, who capped a 30-year career in public service by leading La Plata County as manager during a time of declining revenue, was named Citizen of the Year on Thursday night at the Durango Rocks awards event. Spina, at the Durango Chamber of Commerce’s annual ceremony Thursday, said it was an honor to serve in a county made stronger by its community focus and the care residents show for one another. “Part of the mission statement in La Plata County is to make this one of the best places to raise a family, and I truly believe it is,” Spina, who retired Jan. 2, told a crowd of more than 200 at the Community Concert Hall at Fort Lewis College. La Plata County Commissioner Julie Westendorff said the county was fortunate to have someone with Spina’s knowledge and experience to serve as county manager during the revenue crunch. “We’re in a transition period, and to have someone with her confidence, experience and skill with her hand on the rudder was incredibly important,” she said. Staff members know by heart many of Spina’s principles in guiding them through tough issues, Westendorff said. “You want to walk around the compass,” Westendorff said was frequent advice to ensure all perspectives were studied. “We need to take a deep dive into this,” was Spina’s take when further study was needed. J. Paul Brown, a Ignacio-area rancher who served as a county commissioner, said he remembers Spina’s professionalism. Spina, 63, who has called La Plata County home since 1985 when she began working with the county in the court system, told the The Durango Herald she has always been drawn to public service. Since she graduated college in 1975, she has spent all but five years in the public sector. She had planned to retire at the end of 2017, when she was serving as assistant county manager. But when County Manager Joe Kerby announced in June 2017 that he was leaving, Spina stepped up to help with the transition. It was a tough time to lead the county. A combination of reduced residential property taxes and an oil and gas bust has caused a host of problems for the operating budget. From 2016 to 2017, the county’s budget decreased 26 percent, from $104.7 million to $77.5 million. The sharp drop led to tough decisions as the county looked to make do with declining tax revenues. Spina has said in her three-decade tenure with the county that the current situation poses the most significant financial challenges she has witnessed. The La Plata County Board of County Commissioners unanimously chose Spina, who previously had two stints as interim county manager, to take the helm. She is the first woman to serve as county manager. Spina was raised on a farm in Methuen, Massachusetts, a small town about 30 miles north of Boston. She lived in a traditional Italian family household, with her parents, two older sisters, grandparents and her father’s sister all under the same roof. After graduating from college, she began work at the World Bank in Washington, D.C., in the International Finance Corporation, which helps grow the private sector in developing countries. 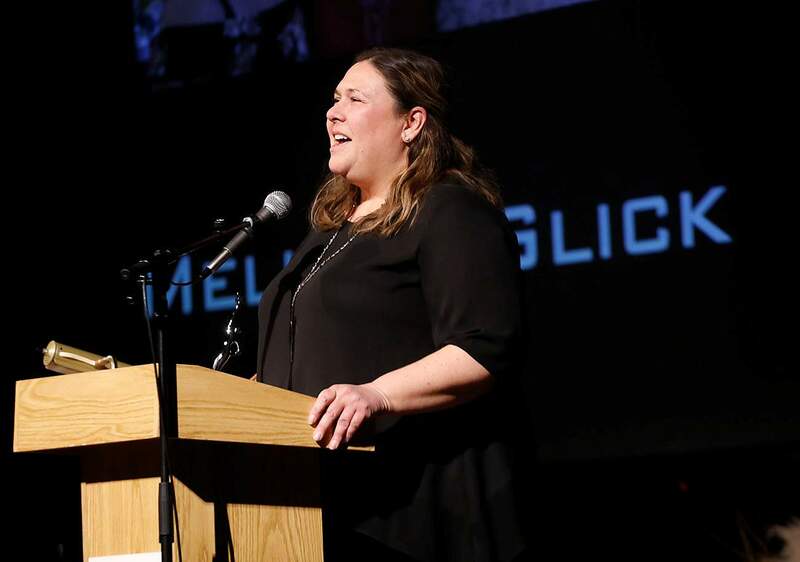 Morley Ballantine AwardMelissa Glick, CEO of Think Network Technologies, a Durango-based information technology company, won the 2019 Morley Ballantine Award, which honors women for their work in business and philanthropy. Melissa Glick, CEO of Think Network Technologies, an information technology company, accepts the Morley Ballantine Award on Thursday night at Durango Rocks, the Durango Chamber of Commerce’s annual award ceremony held at the Community Concert Hall at Fort Lewis College. The award honors women for their work in business and philanthropy. Beth Drum, who presented the award, noted Glick serves as a role model and inspiration for women looking to enter the executive suite and who desire careers in technology. In 2014, Glick co-founded the Professional Women’s Network of Durango to connect women in the Four Corners by providing a community in which they could mentor, guide and support each other through professional development, social events and by volunteering. Glick said she strives to help women build their confidence, an area she said she struggles with. Business of the YearDurango Dermatology was named Business of the Year. It was founded in 1970 by Dr. Lawrence Gaughan, the father of Dr. Mark Gaughan, who currently heads the practice. 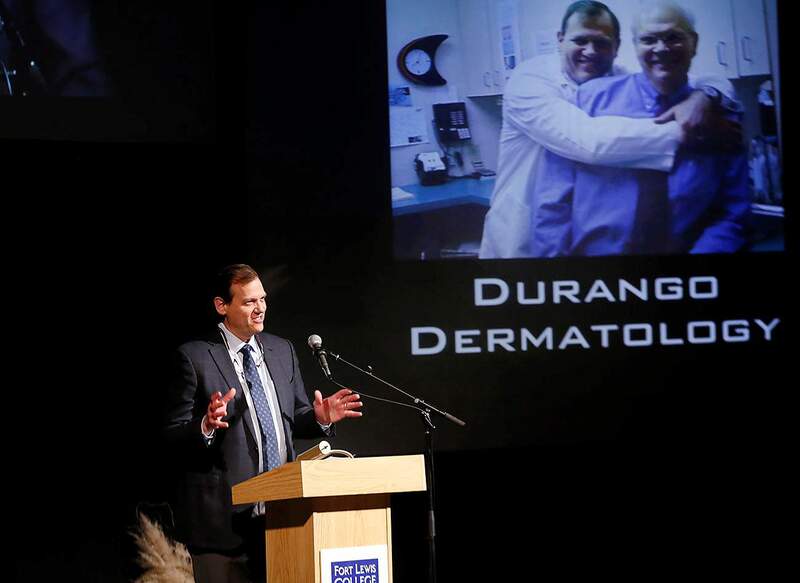 Dr. Mark Gaughan with Durango Dermatology accepts the Business of the Year Award on Thursday night at Durango Rocks, the Durango Chamber of Commerce’s annual award ceremony held at the Community Concert Hall at Fort Lewis College. Mark Gaughan said his parents started the practice when 33 doctors were practicing in Durango compared with almost 250 today. The most important person in the office, Gaughan said, is the patient, and the second most important are the practice’s employees. The staff of two doctors, two physician assistants and two nurses have a combined 160 years of medical experience in providing care. “In this day and age, with everyone switching jobs, that’s pretty incredible,” he said. “We try to give everyone the highest quality care possible,” he said. Durango Rocks The Durango Chamber of Commerce held its annual awards event Thursday night at the Community Concert Hall at Fort Lewis College. The Durango Chamber of Commerce honors businesses and individuals annually for philanthropy, community involvement and business development at its Durango Rocks event.